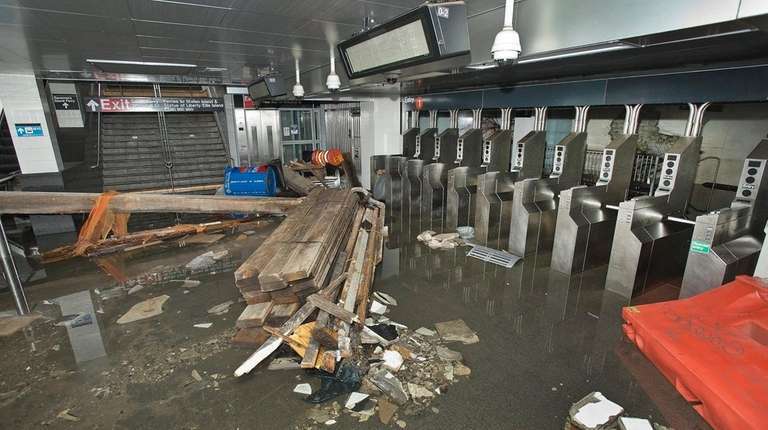 Superstorm Sandy pummeled the 2,135 miles of MTA subway and rail tracks in the New York region on Oct. 29, 2012. The worst storm to hit the city in 150 years filled subway stations and tunnels with gallons of corrosive saltwater that did billions in damage to the city’s transit infrastructure. The deadly storm was a reminder of the MTA’s vulnerability. It’s reshaped the agency’s approach to resiliency, forcing a more immediate assessment of global warming and the precariousness of the agency’s coastal and below-ground infrastructure. The MTA managed to restore 80% of subway service within five days of the storm. Two weeks after the storm, most MTA services had been restored, with the exception of the Montague Street Tunnel of the N and R trains; the South Ferry 1 train station and A train service to Far Rockaway. It’s preparation for the inevitable. Climate change and rising sea levels mean powerful storms like Sandy, estimated to strike once every 400 years, will occur more frequently, according to experts. Projections in a Rutgers University-led study out earlier this month found that, depending on actions taken against climate change, Sandy-level storms could hit New York City between 3 times or 17 times more frequently by the end of the century. At the extreme, that means a storm like Sandy could arrive in New York City once every 20 years. “However, an event like Sandy occurring every 20 years is something New York City could not handle,” Horton continued. To brace for the future, the MTA has secured about $4.1 billion in resiliency funding. That money has been, or will be, dispersed toward more than 80 construction contracts to rebuild and harden the MTA’s transit network. Of those contracts, 35 have been completed; 22 are under construction and 24 will be awarded by either the end of 2016 or 2017. Among the highest profile contracts to be awarded include the rehabilitation of the L train’s Canarsie Tunnel, with an estimated cost of $1 billion, and fortification of the Coney Island Complex, one of the largest rail yards in the country. The contracts have focused on vulnerable assets, specifically underriver tunnels, stations near the coastline, rail yards, bus depots, subway power stations, pump rooms and signal rooms. “Fortify is the first thought of engineers, but it’s only one of the strategies of resiliency,” said Alexandros Washburn, industry professor and founding director of the Center for Coastal Resilience and Urban Xcellence at Stevens Institute of Technology. “Second, is bend not break. Third is to consider the system itself. Ortiz acknowledged that it’s sometimes difficult to explain what exactly “hardening” means. In some instances, it’s simply rebuilding 90-year-old infrastructure with contemporary equipment. The duct banks of the Montague Tunnel, which encase electrical components, were built with terra-cotta in the 1920s. An ongoing resiliency project at the MTA’s St. George station of the Staten Island Railway also calls for raising important station components to street level, out of a flood’s reach. One of the biggest challenges is sealing off street-level openings of subway stations—including stairwells, vent base hatches, elevators, escalators and manholes—because stations lack uniformity. Washburn gave credit to the work the MTA has done so far. Though he criticized the agency for not including more projects to increase redundancy within the transit network, which Washburn considers an important element of resiliency.